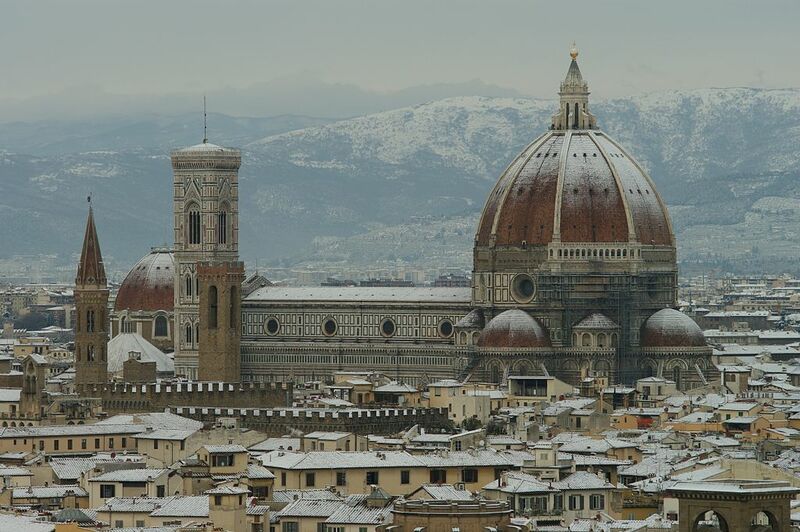 The Cathedral of Santa Maria del Fiore was the major church in Florence in the Renaissance period, but it was a building which was largely built in the fourteenth century (thus pre-dating the Renaissance). The origins go back to the Middle Ages, when Italian cities competed to build larger and greater cathedrals. Pisa began its cathedral in 1063, and Siena built its cathedral by around 1260 (Giovanni Pisano later designed the facade). In the late thirteenth century, Florence began work on its own, new cathedral to replace the smaller church of Santa Reparata which had stood in the city center in front of the Baptistery of San Giovanni. Florence was a wealthy medieval city on account of its textile trade, and Florentines of this time thought of themselves as a city similar to that of ancient Rome. They therefore decided that in order to compete with other Tuscan cities, they would build the grandest church in the regions. They wanted it to be able to fit all 100,000 people who lived in the city, which would have been an enormous structure in any period of history. Although they fell short of this goal (they were only able to fit about 30,000 people in the final church), they managed to create an extraordinary building for their great city. Arnolfo di Cambio was hired as the first architect of the church, construction of which began in or around 1296. The exterior is notable for the geometric patterning of its revetment (face), made from encrusted marble. It mimics the Tuscan Romanesque style of the revetment on the baptistery, which can also be seen on the Florentine church of San Miniato. It should be noted that the facade of the cathedral does not date to the Renaissance, but instead to the nineteenth century. Unlike in countries to the north, facades in Italy were considered to be lesser in importance and were put on at the end – and in this case, several centuries after the rest of the church was already built. We can also see how the revetment was carried over into the campanile (bell tower) which stands next to the cathedral. The campanile, which was designed by Giotto in 1334, was built to look like it came in sections. 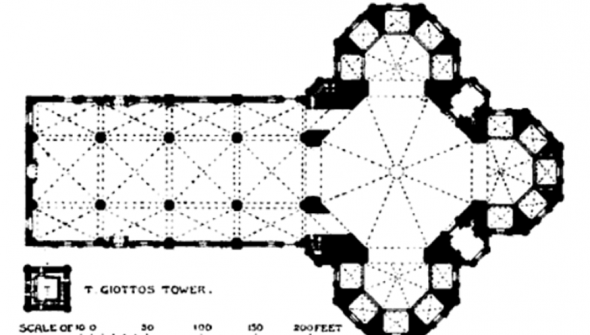 It is altogether separate from the rest of the church, which was typical in Italy at the time but which was different from the integrated tower-in-facade approach in countries to the north. Interior of Santa Maria del Fiore, Florence. Inside, the original plan originally called for a timber truss roof, but in the mid-1300s this was changed to a ribbed groin vault. Flying buttresses were also called for in the original plan, but they were later scrapped. One of the notable features here is the size of the bays, which are quite a bit larger than the size of those found in Gothic churches being build in the thirteenth century to the north. The large arches used to create these bays meant that the church was much more open between its nave and side aisles, and visually the side aisles appear to be somewhat shallow. Together with the long, prominent molding above the arches, there was an emphasis in this church on horizontal elements. This is something that was typical of Italian tastes, and it differs from the tastes of those in places such as Germany and France where the great Gothic cathedrals were built with so much emphasis on their vertical elements. Another difference between Santa Maria del Fiore and the Gothic churches to the north was the size of windows. Here, the windows are smaller. The desire to disintegrate walls in favor of “sheets of glass”, such as found in the Chapel of Sainte Chappelle in Paris, was clearly not present in Florence. There is also willingness in Florence to leave blank spaces on the walls of the cathedral. Plan of the Florence Cathedral. Note the large crossing which would be covered by Brunelleschi’s dome in the fifteenth century. Perhaps the most important part of this church, however, was the part that was not built with the rest of the church. This was the enormous dome which covers the crossing, a dome so large and notable that after it was built, its name came to be synonymous with the church itself (“Il Duomo”). When the church was designed, it was done so by builders who did not know how they could surmount the space of the crossing with a covering. They assumed that it would be covered at a later date as technology or human ingenuity rose to the challenge, but until that happened it remained uncovered for many years. 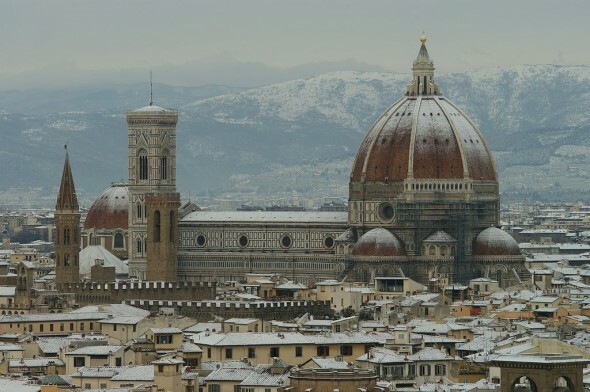 It was not until Filippo Brunelleschi, one of the greatest Renaissance minds, devised a plan to build the dome around 1425 that the crossing was finally covered. The first time I had visited this work of art, this fabulous structure left me in awe. This is a must of all to see young and old. ItalianRenaissance.org, "Cathedral of Santa Maria del Fiore," in ItalianRenaissance.org, July 17, 2012, http://www.italianrenaissance.org/cathedral-of-santa-maria-del-fiore-in-florence/.